The LG G6 announcement is just over a week away and the hype is getting real. LG keeps boosting that with little teasers that focus on specific features of the device. This time we got two videos, focusing on the device’s water and dust resistance. LG teased the outline of the device along with sneaky background, hinting to the IP certification. 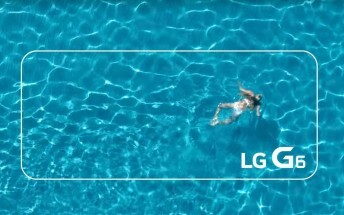 The first 11-second clip is just a girl swimming diagonally across a pool with the outline of the device and LG G6 appearing in the end. There’s also a copy “Taking a day off at the pool? Just relax and enjoy LG G6”, hinting that you can go in the water with the phone without any worries. The second video is even shorter - just 7 seconds. It’s called “Flour” and all we see is some flour poured onto a board, again with the G6 outline and name. Looks like the device will also be dustproof and you won’t have to worry about dropping the phone in dust, flour, porridge and other sticky foods you can just later wash away.